Tillerson’s speech also signaled a significant hardening of US attitudes towards China's Belt and Road Initiative. 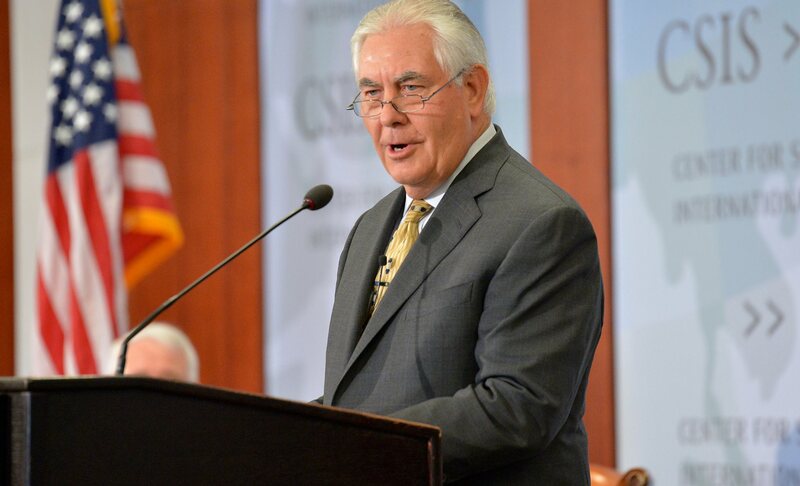 Secretary of State Rex Tillerson speaking at CSIS in Washington, DC yesterday. Yesterday US Secretary of State Rex Tillerson delivered his most substantial remarks on India to date, ahead of his first official trip to South Asia. While Tillerson’s influence in the Trump Administration is in considerable doubt, his speech pointed to yet more convergence between Washington and New Delhi, a more aggressive attitude towards China’s flagship Belt and Road Initiative (BRI), and a continued effort to coax India into a larger security role in the Indo-Pacific. Broadly speaking, Tillerson’s speech signaled three things. First, it marked a doubling down of US support for India’s rise and the US-India partnership, building on the progress made at the first meeting of Prime Minister Narendra Modi and President Donald Trump in June. In addition to reiterating the familiar list of shared values and interests, Tillerson was particularly candid in his discussion of mutual concerns over China, which both US and Indian officials have in the past typically discussed in more oblique terms. Tillerson clearly and repeatedly drew a contrast between Indian responsibility and Chinese rule breaking, declaring that 'China, while rising alongside India, has done so less responsibly, at times undermining the international, rules-based order - even as countries like India operate within a framework that protects other nations’ sovereignty'. While this was a message directed first and foremost at India, it was also an opportunity to set out an approach to China independently of the rolling North Korea crisis. Second, and more notably, Tillerson’s speech appeared to indicate a significant hardening of US attitudes towards the BRI. The US-India joint statement in June had included a single, indirect sentence emphasising that regional connectivity should be 'transparent', employ 'responsible debt financing', and respect 'sovereignty and territorial integrity, the rule of law, and the environment', plainly implying that China had failed to do these things. Still, this fell short of India’s full-throated attack on the scheme a month earlier. Then on 3 October, US Defence Secretary James Mattis took a harder line, starkly telling a Senate hearing that 'in a globalised world, there are many belts and many roads, and no one nation should put itself into a position of dictating "one belt, one road"', referring to China’s term for the BRI. Tillerson’s statement went further still. He made reference to 'predatory economics', observed that many schemes 'often fail to promote jobs or prosperity for the people they claim to help', and urged 'tools that will actually help nations instead of saddle them with mounting debt'. Tillerson expanded on this theme in the Q&A session, abandoning the circumlocution and mentioning China by name. More significantly still, Tillerson urged 'some means of countering that with alternative financing measures', and noted that he had begun a 'quiet conversation' with other foreign ministers at the East Asia Summit Foreign Ministers’ meeting in August. Tillerson sensibly acknowledged that 'we will not be able to compete with the kind of terms that China offers', but warned: 'countries have to decide: What are they willing to pay to secure their sovereignty and their future control of their economies?'. India will be delighted at this policy shift, from sending a US representative to the Belt and Road Forum in Beijing in May to this tougher approach. It also dovetails with the India-Japan joint statement last month and the associated ‘Act East Forum’ created as part of Shinzo Abe’s visit to India. India will hope that this also shapes Australia’s more uncertain debate over the BRI in New Delhi’s preferred direction. However, it remains uncertain whether this new anti-BRI front will translate into concrete action, especially given China’s commanding advantages in mobilising state-backed capital and coordinating state-owned enterprises, and India’s longstanding weaknesses in delivering such projects. With Tillerson so obviously marginalised in the Administration, India will be aware that his political capital is fairly limited. Third, and finally, Tillerson's speech was not merely a statement of the US commitment to India’s interests ('security issues that concern India are concerns of the United States') but also a call for India to do more. Tillerson hailed the US and India as the 'eastern and western beacons of the Indo-Pacific', but this came with strings. 'For India', said Tillerson, 'this evolution will entail fully embracing its potential as a leading player in the international security arena. First and foremost this means building security capacity'. This included 'equipping other countries to defend their sovereignty' (perhaps an allusion to Afghanistan or even Vietnam) and 'greater engagement and cooperation with Indo-Pacific democracies'. While hailing US-India-Japan trilateral cooperation, Tillerson coyly noted that 'there is room to invite others, including Australia'. Australia, recall, was excluded from the US-India-Japan Malabar naval exercises held in June, to China’s evident pleasure (there has been a hint that Canberra may be allowed in next year). India will move at its own cautious pace. The new defence minister has rejected boots on the ground in Afghanistan, India’s last defence minister rejected joint patrols in the South China Sea, and the country’s defence budget is the smallest as a share of GDP for sixty years. But in an era of a transactional president, India may find the US pushing more persistently than before on the question of – as Tillerson put it, using a well-known Indian idiom – 'doing the needful' in the Indo-Pacific.